It's the largest river of Hungary. Flows from the Black Forest to the Black Sea and flows through 4 capitals: Vienna, Bratislava, Budapest and Belgrade. 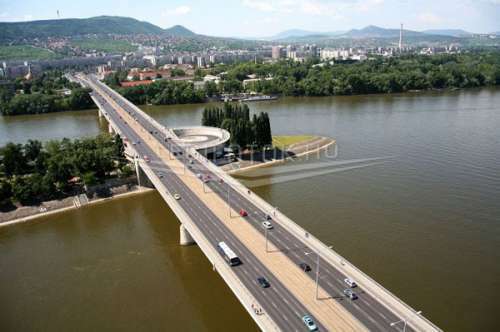 It is said to be the most used bridge of Budapest currently, and more than 150 000 cars pass over it during a day. It also contains a little bridge, connecting it to the northern side of theMargaret Island. The bridge is almost 1 kilometer long, and at the Pest side you can find the Arpad Hid metro stop, and at the Buda side you can find a HEV stop. If you go on this HEV (City Train) it can take you all the way to Szentendre. This was the second bridge constructed between Buda and Pest. The designer Ernest Gouin worked together with Alexandre Gustave Eiffel, the creator of the Eiffel Tower and the Statue of Liberty in New York. The Margaret Bridge was finalized in 1876, and turned into the most used bridge between Buda and Pest, until it was blown up, parts of the Pest side in 1944, and then parts of the Buda side by the Germans in 1945. The great need for the bridge made the repairing go fast, and it was opened again in 1947. The Margaret Bridge is very nicely decorated. The Margaret Bridge is 607 meters, and from it you can enjoy a beautiful view: The Parlament, the Castle, the Matthias Church, the Chain Bridge, the Elisabeth Bridge, the Gellert Hill and if you turn around you can go for a walk on the Margaret Island. Crossing the Margaret Bridge can be done with tram 4 and 6, said to be the most used tram route in all of Europe. On The Buda side you can also find a HEV (City train) stop, from where you can travel to the beautiful Szentendre. This was the first permanent bridge between Buda and Pest. On the Buda side you can find the Clark Adam Square, from where you can travel with the Castle Hill Funicular to the castlearea, or you can go on foot from the square to the castle area. On the Pest side you can take a look at, or live in, the Gresham Palace (Four Seasons Hotel), the most popular and most expensive hotel in town. You can also see the Academy of Science, or go for a walk along the Danube Promenade. During the Second World War the Chain Bridge was damaged, and needed to be rebuilt. The year of the reopening was 1949, exactly 100 years after it was first opened to the public. 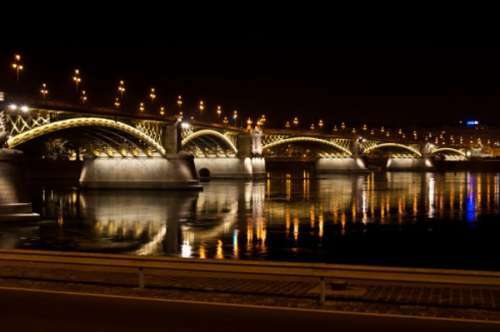 The Széchenyi Chain Bridge is the most popular one among tourists, known for its beautiful lights in the evening. The Elisabeth Bridge received its name from Queen Elisabeth, a queen in Austria-Hungary, who was assassinated in 1898. This bridge was Francis Joseph’s favorite bridge, and during the construction he involved himself ordering it to become a suspension bridge. As it was opened and finished, it was the biggest suspension bridge in the world. The bridges were blown up during World War II in January 1944 by the German troops and it was not possible to rebuild it in its original form. It was only reopened to traffic in 1964. At the Buda side you can find a path that will lead you up to the Citadella, and this can be a really enjoyable walk during spring, summer and autumn. At the Pest side you will arrive to the Ferenciek Square, and the Váci Utca (shopping street) can be found at the Pest side as well. 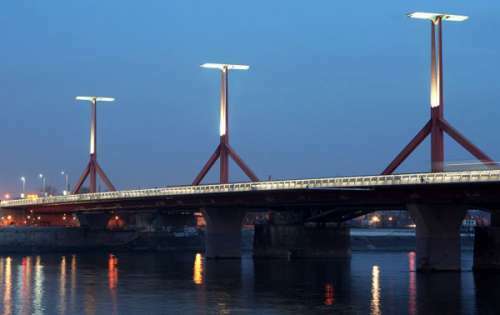 Legendary Hungarian tural birds sit atop the Modernist, bold girders of Liberty Bridge (Szabadság híd). First constructed in 1894–99, it was entirely rebuilt after being destroyed by the Nazis during World War II, and is an exact replica of the original. It was earlier known as Emperor Franz József Bridge, but the Communists unsurprisingly decided on a less imperial name. 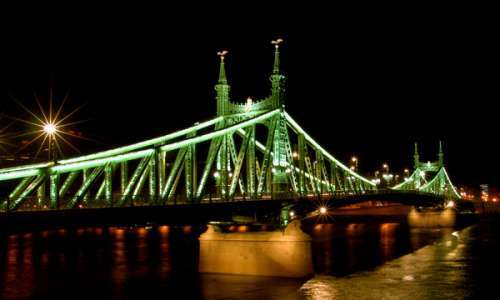 This bridge has received its name from the famous Hungarian poet, Sándor Petöfi. The original name of the Petöfi Bridge was though not the name it is carrying today, but it was named after Miklos Horthy, the Hungarian regent of that time. The Petöfi Bridge was opened in 1937, but it was only in use for 8 years, before the Germans blew it up in 1945. It then had to wait 7 years, before it was reopened for traffic again. Crossing the bridge you will find tram 4 and 6, said to be the most used tram line in all of Europe. The Petöfi Bridge is around 380 meters long. At the Pest side you can find the Boraros Square, from where you can take the HEV (City-train) or you can walk 10 minutes and end up at the National Theater or the Palace of Arts. 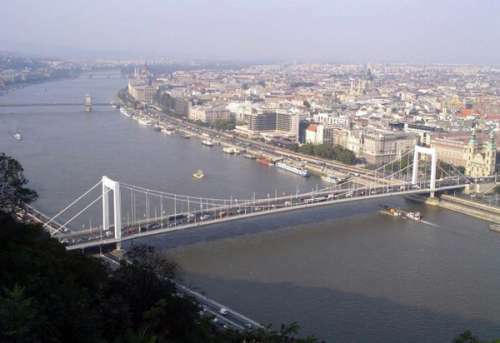 This is the most southern bridge of Budapest, connecting the Pestside (the Palace of Arts and National Theater) with the Buda side, and the district of Lagymanyosi. It is the newest bridge, finished in 1995. It is around 450 meters, and has a special light setting during night time. At the Pest side you can find a HEV stop (City train) that will take you in the direction of the Csepel island. A normal tourist will normally not use this bridge, but if you ever plan to cross it, try to do so after sunset, then it is more enjoyable than during daytime.